When only the finest product labels will do, choose Primera Technology colour label printers. DuraFast Label Company is an authorized Primera reseller serving customers in Toronto GTA and across Canada. We are proud to carry Primera LX-series colour label printers. Whether you need to print small labels and name badges or 8-inch wide labels, we offer the best deals on Primera colour label printers in Canada. Primera LX-series label printers are inkjet based and capable of producing print resolutions of up to 4800dpi. The print quality is incredible and photorealistic. With that level of quality, Primera label printers are best known for printing “prime” labels, which are typically used for labeling consumer-facing products. The Primera LX500, LX500c, and LX910 are excellent choices if you need to print product labels. These are dye ink based printer. Primera Technology also offers colour label printers that use pigment inks to produce more durable, water-, oil-, or chemical-resistant labels. If you need to print GHS BS5609 labels, then check out the Primera LX2000 label printer. This Primera label printer uses pigment inkjet technology from HP to produce durable labels that comply with GHS BS5609 requirements when used with our LX2000 chemical labels. The printed labels can withstand long-term immersion in saltwater and exposure to chemicals — that’s how durable they are. The LX910, which ships with a dye ink cartridge, is has a pigment ink option. The Primera LX910 is a great choice if you need to print both product and industrial labels and have a limited budget. You can request sample labels on any of the printers you are considering, and we’ll be happy to show you the print quality by printing your design file on the selected printers and then mailing the samples to you. 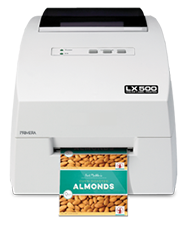 DuraFast Label Company has a large selection of Primera label printers including the LX500, LX500c, LX910, and LX2000. As an authorized reseller in Canada, we are committed to offering the best prices and going the extra mile to ensure your complete satisfaction. 15-day return policy. Once you receive your Primera printer and find it’s not for you, you can return the printer for a refund, less shipping charges. You will be responsible for the shipping charges both ways and the cost of any consumables (ink and labels) that you have used. We can help you select the best label printer for your product labeling needs. Take a look at the selection of Primera label printers below or contact us for assistance.